Accidents happen. We know that, you know it, we all know it. Accidents rarely happen quite like this comedy of errors does, though. 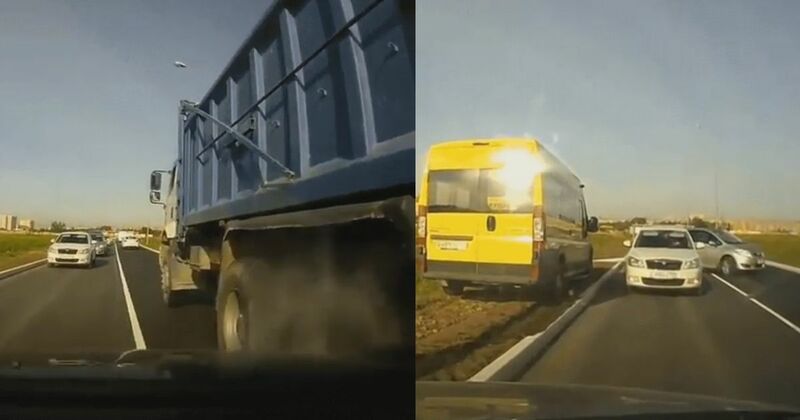 Dashcam footage inside a car captures the moment its driver attempts to manoeuvre around a stationary truck somewhere, we think, in Continental Europe. The driver fails and clips the back of the truck hard. Laughable in itself, the move then sparks a barely believable chain of events that you’ll have to watch again and again to convince yourself they’re real. First, the Toyota Yaris second in line within the camera’s line of sight, whose passage past the truck is now blocked, decides to turn in the road to take a different route. Its driver just stops half-way through the manoeuvre, possibly because a yellow minibus appears unexpectedly over the muddy verge on the left of shot. Then the Skoda Octavia we’ve been looking at for a while tries, for God knows what reason, to reverse somewhere, crashing straight into the Yaris that’s still stranded at an angle across both lanes. What the hell is going on, here? Still, there’s more, as the minibus tries to rejoin the asphalt right behind the dented Yaris. Why? Who knows! Unencumbered by a handbrake, the hatchback simply rolls back into the crawling bus. Cue much arguing.